Photo-realistic controls - looks and works like a real control panel! 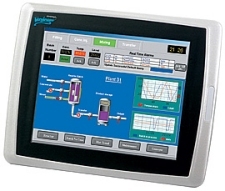 Works with Wonderware® Compact Panels and Touch Panels! Copyright Software Toolbox, Inc., 1996-2010, All Rights Reserved Worldwide. Wonderware, InTouch, and Invensys are registered trademarks of Invensys plc. All other marks are the property of their respective owners. Software Toolbox is a registered trademark of Software Toolbox Inc.